Tiffany's Online Finds and Deals: Looking to redo your kids room? Here is a great deal on Dory or Frozen! Looking to redo your kids room? Here is a great deal on Dory or Frozen! Transform your little one's room into their own underwater world with this Disney Finding Dory Room-in-a-Box with Bonus Chair from Delta Children. 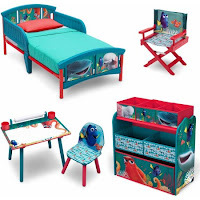 Boasting colorful graphics of everyone's favorite fish, Dory and Nemo, it includes a toddler bed with attached guardrails, a toy organizer with six fabric bins, an art desk with paper roll and dry erase top, plus a director's chair. Creating separate spaces for sleep, play and schoolwork, this sweet five-piece set will make any Finding Dory fan happy.